During 2-hour self-guided appreciate the National Park Service’s new Day of Infamy Pearl Harbor Package includes the USS Arizona Memorial Narrated Tour, admission to the Virtual Reality Center and some of the Visitor Center’s most popular souvenirs. The tour is highly recommended to all visitors that desire a more engaging and enriching Pearl Harbor experience. This is a small-group tour limited to a maximum group size of 10. National Park Service’s new Day of Infamy Pearl Harbor package includes the USS Arizona Memorial Narrated Tour, admission to the Virtual Reality Center and some of the Visitor Center’s most popular souvenirs. Millions of visitors from all over the world come to Pearl Harbor to see for themselves where World War II began for the US on December 7, 1941. • A collectible Dec 7, 1941 newspaper (With the complete timeline of the Japanese attack). • A four-color souvenir map and guide of the Pearl Harbor Visitor Center. There are no escorted tours allowed at the Pearl Harbor Visitor Center. 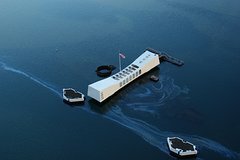 This incredible 2 hour self-guided USS Arizona Memorial Narrated Tour is highly recommended to all visitors that desire a more engaging and enriching Pearl Harbor experience. Hosted by the famous actress Jamie Lee Curtis, Pearl Harbor Survivors and the National Park Service historians, this fascinating Narrated Tour has 29 stops and will bring to life the events that changed the Pacific forever. Let Jamie Lee Curtis guide and narrate for you through the Visitor Center’s two world-class museums, with narration on the USS Arizona Memorial and then along the shoreline for the incredible " Path of Attack" Tour. Hear firsthand from actual USS Arizona and Pearl Harbor Survivors as they retell their stories and retrace the events of Dec 7, 1941. This great package tour also includes admission to the National Park Services’ new Pearl Harbor Virtual Reality Center to view “Witness the Japanese Attack on Battleship Row”, “Walk the Deck of the USS Arizona the Attack” and “Experience the USS Arizona Memorial”. Three awesome VR Tours you will never forget.